A guest post written by Sarah “Sally” Day, Admissions Consultant, Stuart Hall School, Staunton, Virginia, USA. For the past eight years, I have recruited international students for historic Stuart Hall School in central Virginia. It is always a pleasure to meet young people and their families from around the world and to be part of their education choices and experiences. While it is facile and unfair to generalize about students from one country or another, there are some characteristics of Vietnamese students that stand out. Vietnamese students who have graduated from Stuart Hall and the students who have applied, been accepted, or enrolled are remarkable communicators and capable of impressive independence. Some of this is due to strong English language skill but it is more than that. These are students who want to engage and ask questions, want to challenge themselves, and want to stay in touch. Boarder dinner at the home of a Stuart Hall day student. 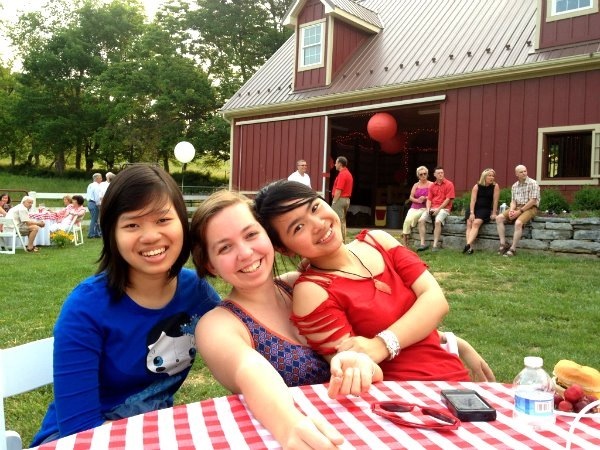 We have a number of Vietnamese students who will attend Stuart Hall this coming fall. Without a doubt, they have emailed me more than any other applicants and accepted students. You might consider the high number of emails as an annoyance but the opposite is true. I have enjoyed all of the communication because it has been thought-provoking, funny, heartfelt, and, above all, honest. We have exchanged music videos, discussed the unnerving and scary aspects of applying to schools and leaving home behind, shared photos of our families, shared recipes, and discussed cultural anomalies. We have Skyped to be sure all questions were answered but also to see each other, to stay in touch. It is challenging to be an international student in an American boarding school. The adjustment is huge: language, culture, homesickness, academic expectations, and fitting in socially. What has impressed me about our Vietnamese students is their willingness to dive into the mix with a combination of sensitivity to others and an attitude of exuberance. They get involved, take leadership positions, share their culture, and make many, many friends. The Vietnamese graduates of Stuart Hall communicate with me on Facebook and via email. They are great supporters of the school and of their classmates. They are happy to communicate with prospective students and willing to answer any questions I might have (e.g., sometimes transcripts can be confusing). They share their successes and worries about university life and beyond. What could be better than that? Have I had similar communication with students from other countries? Yes, but the consistency in my experience with Vietnamese students is why I am writing this post. The level of communication and independence is exceptional. These are students who have taken the necessary steps to become global citizens in a world prone to focusing on what separates people and not what brings them together. These are students who want to succeed and they want the same for everyone else.